The St John Fellowship (the Fellowship) is an initiative based around the world. It is comprised of current and past members of St. John Ambulance; members of the Order of St. John; family members; and those without prior connection who are sympathetic to the organization’s mission. Presently, other St John Ambulance Fellowships operate in England, the Isle of Man, Guernsey, Jersey, New Zealand, and parts of Australia. The Fellowship provides an opportunity to reinvigorate and renew volunteer and member commitment, expand its support base, and strengthen a network already loosely in-place. The Fellowship offers a means to nurture and bring closer together the broader St. John family. For those who do not fit into the above categories but are sympathetic to the aims and mission of St. John and desirous of getting involved, the recommendation of two current members of the Fellowship will be required. The Fellowship is a wonderful way to build closer connections with current and past volunteers, stay involved beyond operational service, and provide a network for social and mutual support. Please join the Greater Vancouver Fellowship Launch! An evening of dessert, and great company in support of our Greater Vancouver Fellowship Chapter launch! The St John Ambulance Greater Vancouver Fellowship Chapter will be having a launch party at the Royal Vancouver Yacht Club on March 9, 2019. St. John Ambulance is one of Canada's oldest charitable organizations dating back to 1883 when the first Canadian branch teaching first aid courses were opened in Quebec City. Growing quickly across Canada to become a national organization, St. John Ambulance would eventually come to British Columbia in 1911. Today, St. John Ambulance plays a vital role in our British Columbia and Yukon communities by providing first aid education, lifesaving tools and important health services. 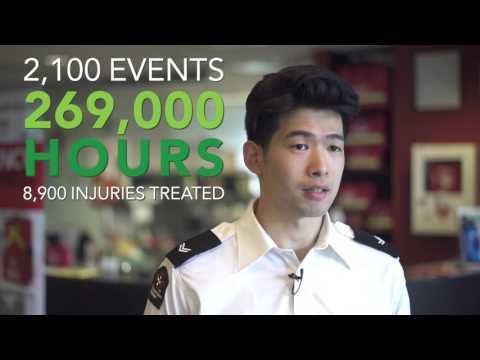 With your support, St. John Ambulance can continue to serve our communities and expand our efforts to help save lives at work, home and play.